KNOX - Mr. Punch on the Links. KNOX, E.V. - Mr. Punch on the Links. Mr. Punch on the Links. - KNOX, E.V. Title : Mr. Punch on the Links..
Map maker : KNOX, E.V.. Date : London, Methuen: 1929. Size : 3.9 x 4.7 inches. / 10.0 x 12.0 cm. 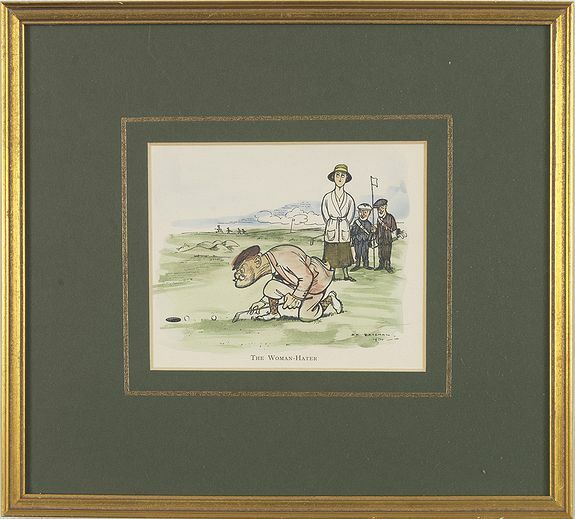 Description :Golfing cartoon taken from the famed English humor magazine Mr. Punch on the Links. Size of the frame : 23x25cm. After Frank Reynolds (1876 - 1953 ). He was born in London, son of an artist. Studied at Heatherley's School of Art. On the staff of The Illustrated London News and The Sketch, and later Punch. In 1906 he began contributing to Punch Magazine and was regularly published within its pages during World War I. In 1920, after 14 years of supplying social cartoons to Punch, Reynolds became its art editor, taking over from FH Townsend, his brother-in-law. Ten years later, a nervous breakdown caused him to abandon drawing for several years. Reynolds's naturalistic style is a legacy of Victorian wood-engraving tradition. He worked mainly, in pencil, pen and ink , or watercolor, and was noted for his confident figure drawing and characterization, though his interest was in generalized ' types' rather than in individuals. Donovan & Murdoch 23340, Murdoch 425. Condition : Framed print in very good condition.